Adding a Fireplace to New or Existing Construction? It’s not easy to choose a fireplace. There are tons to pick from… each with different qualities and features. To choose wisely you’ll need to take into consideration your own needs and what makes the most sense, in design, style, size, features and cost for your home. Do you already have a fireplace in the house? Maybe you just need to update the hearth to make the space more comfortable, usable and safe. If you don’t already have a fireplace you’ll want to know that adding one ‘can’ be quite expensive. Adding a fireplace in the middle of the house might be extremely expensive while adding a vent-free unit on an outside wall might be more inline with your budgetary constraints. You might also want to consider opting for a free-standing stove instead. Are you looking for style? Or Heat? If your only concern is the ‘look’ you might consider getting a gas fireplace. They’re typically low maintenance and less costly to install. If you’re considering preparedness uses, you might want to go for a traditional fireplace that burns wood as wood can be grown. Gas lines can get shut off. Will the fireplace be the main source of heat for your home? Would you be using it to just heat one room or as a backup heating system? If the fireplace store doesn’t have a cost calculator try to determine about what it’ll run you to use a fireplace all winter. How long will a rick of wood last if you use some daily? How much is a rick of wood? Figure gas or propane costs too. Some years both gas and propane costs shoot through the roof. You’ll want to take the cost of this into your calculations. This is also why a good backup heat source is important. Are you up to doing the maintenance that a traditional wood-burning fireplace takes? This means, at the minimum, cleaning the ash…. 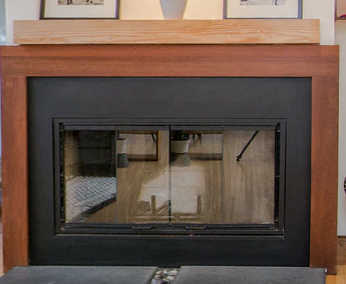 If maintenance is a concern you might want to opt for a ventless gas fireplace as they burn clean (no ash) and are easier to install. Your fireplace, mantel and hearth should match and/or complement the style of your home. An antique turn of the century mantel from the archaeological salvage store would certainly look out of place in a sleek modern home. A modern stream-lined mantel would also look out of place in a farmhouse themed home. No matter which fireplace you opt for be sure to take into consideration style, cost, heat output and maintenance. Your fireplace can be a source of comfort (and heat) as well as a focal point and gathering spot for your family and friends. Prepher – female prepper T-shirt Get it on Amazon! Survival Finds is a participant in the Amazon Services LLC Associates Program, an affiliate advertising program designed to provide a means for sites to earn advertising fees by advertising and linking to Amazon.com.